Recently I tried something new that I wanted to share. I purchased some Ghee for this first time, after hearing and reading about it over the last few years. Ghee is an ancient food, with its origin dating back some 2000 years B.C., in the country of India. It is often recommended by Ayurvedic practitioners, because it has various health properties. The brand I purchased is from grass fed, pasture raised cows. The first thing I noticed was its deep golden color. When I tasted it, I was pleasantly surprised by its butterier than butter taste. According to Wikipedia, Ghee is a class of clarified butter that originated from the Indian subcontinent; and is commonly used in South Asian and Middle Eastern cuisines, traditional medicine, and religious rituals…. 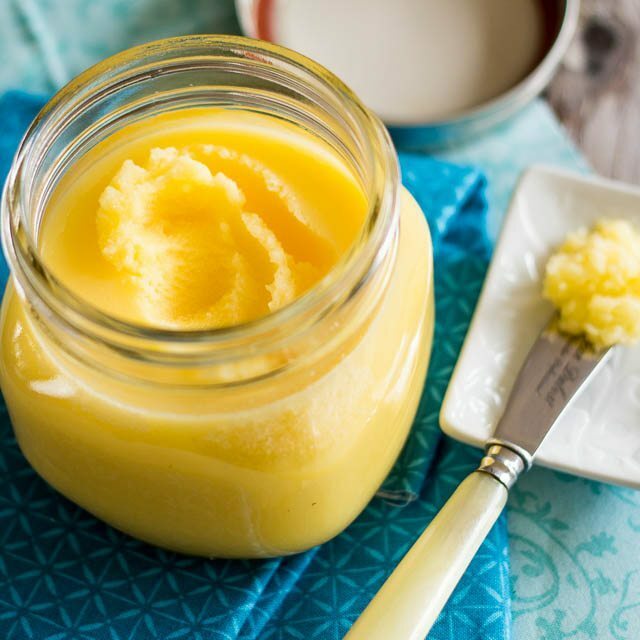 Ghee is prepared by simmering butter, which is churned from cream (traditionally made by churning yogurt), skimming any impurities from the surface, and then pouring and retaining the clear, still liquid fat, while discarding the solid residue that settled on the bottom. Ghee differs from clarified butter slightly in its production. The process of creating traditional clarified butter is complete once the water is evaporated and the fat (clarified butter) is separated from the milk solids. However, the production of ghee includes simmering the butter, which makes it nutty-tasting and aromatic. As I mentioned, I can attest to the rich buttery taste. The other attractive thing about ghee, is that while butter contains 12 to 15% medium and short chain saturated fatty acids, ghee contains 25% or more. These medium and short chain fatty acids while considered saturated fats, are metabolized differently by the body and are not associated with cardiovascular disease. Coconut oil is another popular choice for obtaining medium chain triglycerides. Medium chain triglycerides are converted by the liver into ketone bodies. Ketone bodies can serve as a source of fuel for our cells and importantly our brain cells. This is especially beneficial if the person has developed insulin resistance, which prevents the cells from using glucose efficiently for fuel. The short chain fatty acids found in ghee, such as butyrate help support a healthy digestion and immune system by providing fuel for the cells that line our colon (colonocytes). These saturated fatty acids make up about 62% of the total fat content. Monounsaturated fat (similar to the predominant fat in olive oil), makes up 28% of the profile. And, polyunsaturated fatty acids comprise less than 4%. Typically, saturated fats can be heated to higher temperatures without damaging them. Saturated fats are also less likely to be oxidized by air and light. While saturated fats are the most stable against those elements, polyunsaturated fats are the least stable. Examples of polyunsaturated fats would be flax oil, walnut oil and fish oil. Those oils need to be protected from heat, light and air. They should be kept in a dark bottle, sealed tightly and refrigerated. Traditional butter has a smoke point of around 350°F, while ghee had a smoke point of 450°F. The smoke point is that point at which the oil overheats and begins to smoke and become damaged. This allows ghee to be used at higher temperatures than butter. It’s never a good idea to cook with fats or oils at very high temperatures anyway. Cooking oils at very high temperatures not only destroys the healthy phytonutrients, but it can also result in an increase of free radicals, leading to damage of healthy cells within our bodies. The thing that makes ghee a good option for people who may have certain allergies to dairy, is that the process of making it removes the casein and the lactose which are the two components that cause the most issues with dairy allergies. In Ayurvedic medicine ghee is also used for constipation, ulcers and to support gallbladder function. Higher levels of CLA (especially if derived from grass fed cows)- CLA has been showed to aid in weight loss, lowering cholesterol, lowering blood pressure and reducing inflammation. Since I subscribe to a diet high in healthy fats and low in simple carbs, I am adding ghee to my repertoire!